This is another post about primary biliary cholangitis (cirrhosis) [PBC]. In my last post, I used the term End-Stage Liver Disease [ESLD]. It’s a very vague and barely useful designation. The good news is that my portal hypertension — once the subject of so many gruesome posts — has been effectively controlled by the Transjugular Intrahepatic Portosystemic Shunt [TIPS] I had installed in July 2015. I haven’t had a bleed since, and an exploratory endoscopy in the fall showed I now have a nice, smooth, pinkish esophagus instead of one with red streaks of varicose veins. But I haven’t felt better. When I look back on what I could do in 2014 or 2013 and compare it with how I’ve felt the past nine months, I know I am at best holding steady. So at my last hepatologist appointment, I asked the doctor straight out: Do I have ESLD? He looked taken aback, like this was an acronym that doctors use among themselves not with patients. But he said, yes. And so I said, how much longer do I have? Months? Years? And he said he expected years. When the bleeds happened, they were potentially life-threatening emergencies. Still, I’d get patched up and leave the hospital the next day. 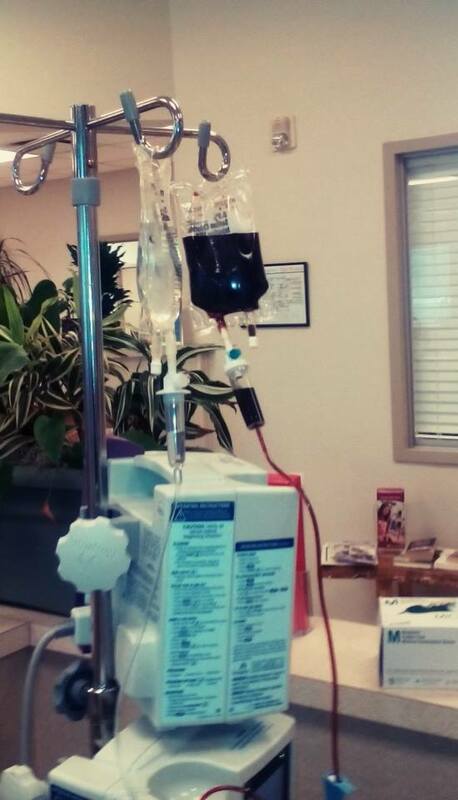 Once they started coming much more often, anemia became a big issue until I got Injectafor iron infusions. I avoided remote locations and long airflights, but as nasty as they were, I now look back on the Bleed years (8/10 to 7/15) as the good old days. I also haven’t had another bout of hepatic encephalopathy [HE], one of the scariest ordeals of this whole PBC ghastliness. But there is a very low grade (comparatively) of HE, and especially when I am even more fatigued than usual, I can tell that I’m having trouble with short-term memory and learning new things. For example, my husband and I went to Washington DC last month, and I simply could not grasp the subway system. It’s hard to remember what day of the week it is; then again, there is little to distinguish them. So what is ESLD? It’s odd. You will find a lot of sites with information on End-Stage Liver Disease, but there’s little mention of when Beginning becomes Middle goes to End. I’m not sure there is a Beginning or Middle variety. End-Stage Liver Disease [ELD] itself is most commonly mentioned in discussing MELD scores; the M refers to Model, and a MELD score is a complicated and flawed scoring system for transplant urgency. The higher the score — and 40 or so seems to be the cap, the worse off you are. I’m at 12. More often, I’ve found articles using a different terminology. The NY Times offers this simple comparison. Compensated cirrhosis means that the body still functions fairly well despite scarring of the liver. Many people with compensated cirrhosis experience few or no symptoms. Decompensated cirrhosis means that the severe scarring of the liver has damaged and disrupted essential body functions. Patients with decompensated cirrhosis develop many serious and life-threatening symptoms and complications. But then there’s another approach using four levels. Here’s one that does it in three: inflammation, scarring, failure. I wonder if, since the liver is the only major organ that up to a point can regenerate new cells, it would be possible to get out of inflammation back to normal. But cirrhotic cells are scarred and ruined; they aren’t going to come back to life. And my PBC continues to destroy the bile ducts, and this blockage continues to damage liver cells. I haven’t updated since October of last year. I get comments now and then, asking how things are going. To catch you up if you are new here, I have been writing about my battles with Primary Biliary Cirrhosis. While I haven’t had any more esophageal bleeds or episodes of hepatic encephalopathy, this condition continues its destruction. Although my bilirubin and albumin are worse than they were this time last year, it’s the psycho-social effects that have been devastating this winter. I intend to write more, but shorter, posts on those aspects of End Stage Liver Disease. But first up is that I no longer have Primary Biliary Cirrhosis, according to the international health community. I have instead Primary Biliary Cholangitis. Cholangitis isn’t an altogether accurate a term to take the place of cirrhosis for this illness. I suppose cholangitis was assumed a good enough switch since in both cholangitis and primary biliary cirrhosis, the bile ducts are compromised. But there are some very significant differences. Simple cholangitis is usually caused by a bacterial infection; primary biliary cirrhosis (cholangitis) is an auto-immune condition. The prognosis for simple cholangitis is good if caught in time. There are a variety of treatments. Primary Biliary Cirrhosis or Primary Biliary Cholangitis has one drug that may slow the progression of bile duct destruction. It will lead to cirrhosis and end-stage liver disease. How long this will take varies, but it will happen. The only fix is a transplant, and, since this is an auto-immune illness, it isn’t unusual for it to recur. The name made sense: primary (firstly), biliary (bile ducts destoyed), cirrhosis (inevitable effect in the long-run). But at least the same letters apply, so PBC can become PBC. Why change to a less accurate name? Ignorance and prejudice. Although there are many conditions that can cause cirrhosis, the biggie is excessive alcohol use (of course, there are daily drinkers who do not reach end-stage liver disease) and hepatitis (and one of these can be caused by using dirty needles). And so cirrhosis is a huge trigger word: this person’s lifestyle has caused her condition. For many, the social stigma is as bad as the condition itself, and the medical community decided these people have enough to deal with. They are not even close to fixing the disease, but lessening the instant self-righteousness of the unafflicted is within their range. Say “I have primary biliary cirrhosis.” Most people hear something like “I gobblledly gook blab blab cirrhosis.” Next, they likely speculate on what vice is the cause of the problem. It’s a rare enough illness that I have had to explain it to first responders and ER nurses. You can feel what isn’t said: the emergency personnel have scraped up enough people killed by drunk drivers to have no sympathy for heavy drinkers. Believe me, there are no heavy drinkers among those with PBC whose livers are failing. If the liver can no longer handle red meat, it isn’t going to be up to processing alcohol. Maybe we once drank cheerfully and heartily. Maybe we were teetotalers. Neither would have made any difference. At least the next time I’m hauled in my biggest problem with listing my medical history will be remembering how to spell cholangitis, and not dealing with all the baggage cirrhosis drags around. There’s a new series of posts I am planning, but first I need to catch up on my bloody misfortunes. It’s been a year since my last post on a bleed, caused by portal hypertension, in turn itself caused by damage to the liver, in turn caused by my autoimmune illness, primary biliary cirrhosis. But I have had two since then, and am now up to 17 transfusions. First, let me say something about these transfusions. I wouldn’t be here tonight if it weren’t for people who give blood. Sometimes when I’m wandering around, I ask myself: was it her? Or him? Whose blood is in my body? I cannot know, but I thank anyone who has ever given — or even just tried to give — blood. These are rare and strong and generous people. Back to these bleeds. Number 9 hit in September, when I was in Miami, trying to help my 84-year-old mother, and was a 2-transfusion bleed, as was bleed 10, that waited until February, less than a month after I moved my mother out of Miami. This one occurred a year to the day after my beloved collie died of hemangiosarcoma, a canine cancer that causes sarcoma to develop. Mine was on my dog’s spleen. It ruptured, and he bled out. 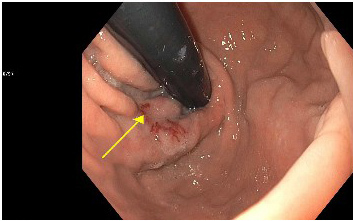 The doctor who performed the endoscopy here couldn’t find the source of the bleed. But a month later when I went to see my hepatologist at University of Alabama’s Kirklin Clinic, he found an actively bleeding varix at the fundus, where the stomach and esophagus meet. The site of multiple bleeds of mine has been at that little crook to the left of where the arrow is pointing. In fact, this is the same site as my first — and still worst — bleed, the one that that the GI who saw me in the ER thought to be a bleeding ulcer and that for a while my hepatologist thought might be a Dieulafoy’s Lesion or a Cameron’s Erosion. But after reviewing my records, now the theory is that the same area keeps bleeding because it was weakened by the three clips (like tiny clothes pins) put in as an emergency approach to shutting down the 4-transfusion bleed I wrote about back in August 2010. Banding, essentially using the equivalents of rubber bands, to cut off the supply of blood to a bleeding varix or one that looks like it could become a bleeder, is the preferred approach. The clips are a last resort. The reason I keep having these bleeds may then be because the delicate walls of the esophagus have been compromised by the clips. One thing others with primary biliary cirrhosis should know is that having these bleeds is extraordinarily unusual. I asked my hepatologist if other PBC’ers have similar problems with repeated bleeds, and he said, no, he has never seen or read of a comparable case. Back when I first decided to write about having primary biliary cirrhosis in November 2009, I never figured that this would become my bloody blog. I have neglected the blog for months because if I am going to follow through with my plan to write an account of living with this auto-immune illness, then I have to, once again, post about another bleed. Each has its own special moments, however, and here I have two warnings for you, and a comment from my gastroenterologist. Once again, as in bleed 7, the culprit was my Cameron’s Erosion (or Lesions), an ulcer “in the hiatal sac of patients with hiatal hernia,” which is how Wiipedia’s 2-line article describes the thing. You know you have a rare condition when Wikipedia has next to nothing. I described what I learned about Cameron’s after bleed 7. The link to PBC is that because my liver is compromised by the disease, it is too dangerous to repair the hiatal hernia. I’m getting better at identifying the onset of these bleeds, anyway. This time I even drove myself to the hospital. Signs were clear: black BM and the taste of iron in my mouth. Now for the three things that made this bleed memorable, and some advice. 1. Do not let a doctor put in an IV. There is some incompatibility between all the things that I might need intravenously during a bleed, and so I end up with IVs in both arms. 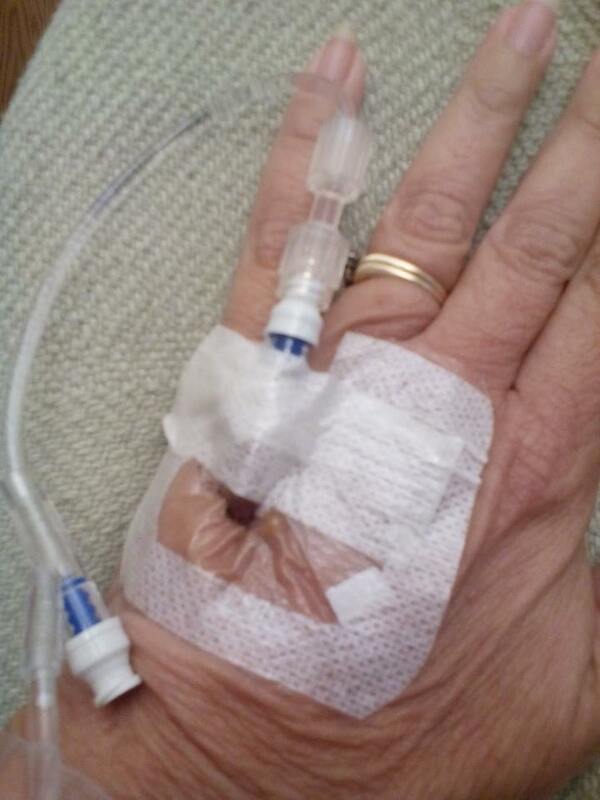 I had a great nurse in the ER who inserted the first IV as painlessly as I can remember. Then this doctor or resident drifted in. I could tell he hadn’t been on the job long — and thought he was God’s gift to the world — because he was wearing a V-neck scrub top that let me see way too much of his curly chest hair way too close up. He wanted a little practice with IVs, I guess. So he tried to start the second line. And failed, miserably. Blood spurting and me doing the vasovagal response — that is, fainting. Finally the nurse guided the doctor’s every move and the second IV was inserted. She was a great nurse, and I asked her later, how do you stand that — doctors coming in and thinking they can do all you can, and you having to deal with the aftermath. Diplomatically, professionally, she responded that at least that doctor will think twice before he gets snippy when a nurse has trouble with an IV. 2. It hurts like hell to have your stomach pumped. And it’s worse when there’s no reason to do this. My bleeds sometimes have two parts: black stool and vomiting. The vomiting always happens, but when both occur, usually comes an hour or two later. This time, I got to the ER before I vomited. All that I needed was time, but for reasons best known to himself (and that itself is a problem), my ER doctor decided that instead of letting things take their course, he would pump the blood from my stomach. Never again. I would have been better off sitting outside the doors of the ER until I threw up. 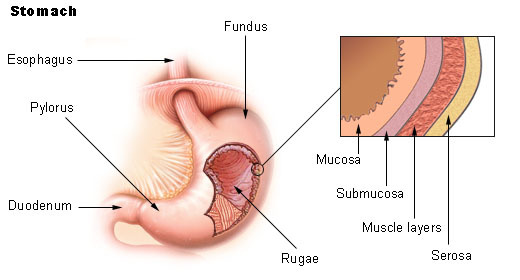 I always imagined stomach pumping would involve a tube down the throat, turning on the pump, and whoosh, all done. This is what it is like to have your stomach pumped: A tube is inserted up your nose and down your throat. If the first nostril tried gives the nurses trouble, then they start over with the second. They keep giving you water to drink so you swallow, and swallow down the tube. Maybe it was just me, maybe the tube was just lodged against a nerve, but it hurt like hell the entire time the tube was up my nose and down my throat. And the entire time isn’t a matter of minutes. It’s a matter of hours. The pumping is slow and not constant. 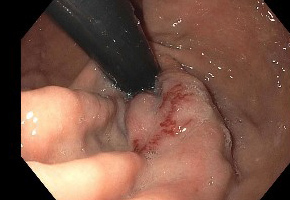 You watch the content of your stomach (in my case, red blood followed by black) slowly proceed down this thin tube. Sometimes it starts flowing backwards. I supposed most who OD and have their stomachs pumped are out of it. I can’t imagine that anyone who has had it done would risk OD’ing twice. I was not out of it. Other than a local anesthetic sprayed in my throat, I had no recourse but to lie there in pain between 1 and 5:30 in the morning and watch my blow flow out of my stomach. I talked to my floor nurses about this, and each said, you always have the right to refuse a procedure. And refuse I shall. Actually, her advice misses the mark. Not going out during lightening storms is an action I can take to avoid without fail being one of the rare people struck down. But there is no way I can avoid without fail the next bleed. 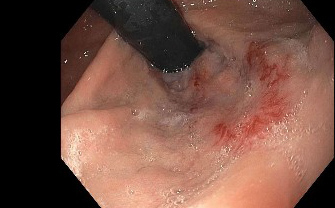 I’ve described the gory consequence of my primary biliary cirrhosis: gastrointestinal bleeds. There’s also collateral damage, for want of a better term, that isn’t so dramatic and isn’t life-threatening, but like the disease itself, slowly does lasting harm. Primary biliary cirrhosis [PBC] is an autoimmune illness in which the body’s own immune system destroys the bile ducts of the liver, leading to cirrhosis and liver failure. Most research suggests the disease’s progress can be slowed by years, even decades, in patients diagnosed early who respond to medications that thin the bile. I started out as one of these lucky ones. I was diagnosed in December 2006, responded immediately to ursidol, and my liver chemistry values largely returned to normal. I ignored my disease 364 days a year. On the 365th, I went to the Liver Center at University of Alabama-Birmingham. I didn’t even tell most people about it. It seemed abstract, really: just a matter of numbers. Some of the collateral damage is to other parts of my body. My hepatologist tells me that his patients frequently complain that their teeth are crumbling. My salivary glands don’t work properly. My mouth is like Afghanistan: dry, bloody, and hopeless. You know that question mark shaped thing that dentists hook over your teeth to suction fluid while they work? They don’t need to use one with me. But then the bleeds started, with the first and worst in early August 2010, followed by another a year later, a third in early March 2012, and, since October 5, 2012, four more. 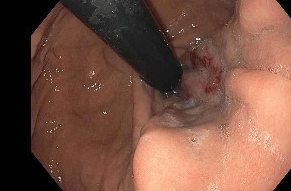 Even after the first and second bleeds I could convince myself that with more frequent endoscopies, these could be prevented. And then came this fall. I have been rather spectacularly unlucky. I should make it clear especially to others with PBC that my experience is not typical. The bleeds are like a side effect of PBC. Some people have them, and many don’t. My hepatologist says it is very unusual for someone to have as many bleeds as I have had so close together. When you have four hospitalizations in 16 weeks, it’s hard to ignore that things are not going too well — and you can’t keep the problem to yourself. People start worrying. And the soul-lacerating collateral damage mounts. Because of this illness, I am not as good of a mother, wife, daughter, friend, sister, aunt, neighbor, or even pet owner as I like to think I otherwise would be (this was going to be the year I kept up with the collie’s coat). I don’t have the energy that others do. After bleed 7, I had three transfusions, but still I am anemic. I need to visit my 83-year-old mom, but I’m scared to fly. The thing about these bleeds is that there are only two warnings I have experienced: fatigue and loss of appetite in the 12 hours or so before one starts. But lots of things can cause that. The bleeds are stoppable if IV fluids and drugs can be administered in a timely fashion, but what would happen if I started throwing up blood on a plane? Moreover, how much use would I be to my mom if I began a bleed while visiting? I drove a half day away to see my son for his 23rd birthday. He spent it visiting me in the hospital. My children were 14 and 20 the first time. None of us knew what was happening. They saw it all, as did my husband: the blood, the shock, the ambulance sitting in the street for 15 minutes before even starting for the hospital. I had four transfusions that time and rebounded quickly. We thought it was a one-off. For a year it seemed it would be. The thing is, the bleeds aren’t painful. Gross but not painful. The worst part is the IV sticks. What is painful, though, is knowing that what is happening to me is taking a toll on those I love — and there isn’t a thing I can do about it.